criminatively thus propitiating the use of a method that might not be cost efficient. breed of the animals and the presence of the male [4,5]. 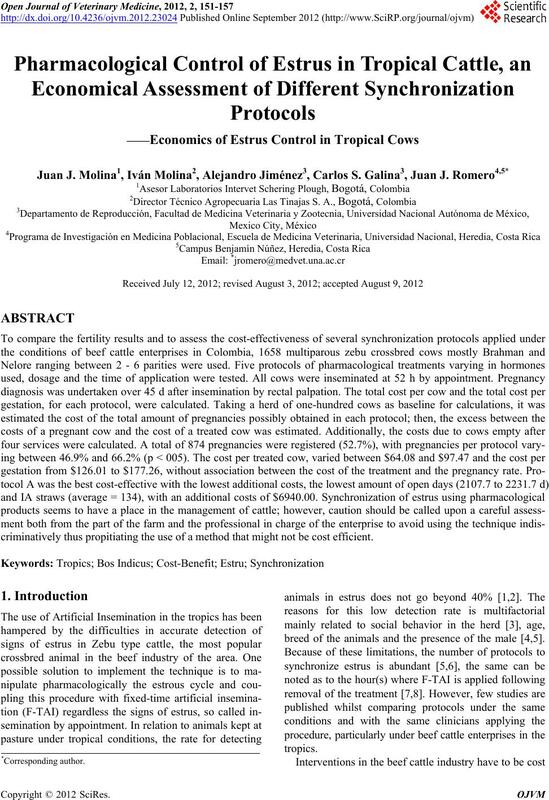 J. J. MOLINA ET AL. culled and more open days among cows not culled. item to be evaluated . 06˚29'40" latitude north and 74˚24'24" longitude west. of follicular activity, detected by rectal palpation. tenol (Estrumate®), $14.48; estradiol ciprionate, $9.58. including all the visits, was estimated on $20.00 per cow. calculated using the formulae EPP = (TCG/TCPC)*100.
lombia. The name of the product in bolds indicates the hormone that makes the treatment different. 11 FTAI 52 h. FTAI 52 h. FTAI 52 h.
Fertagyl 1ml FTAI 52 h. FTAI 52 h. FTAI 52 h.
31 - 33 FTAI 52 h. FTAI 52 h.
33 - 35 FTAI 52 h. FTAI 52 h.
11 FTAI 52 h. FTAI 52 h. IATF 52 h. IATF 52 h.
eCG (equine Chorionic Gonadotropin), Fertagyl: GnRH(Gonadotropin R elease Hormone), Mesalin: Estradiol beanzoate. Norgestomet (p < 0.05) (Table 2). 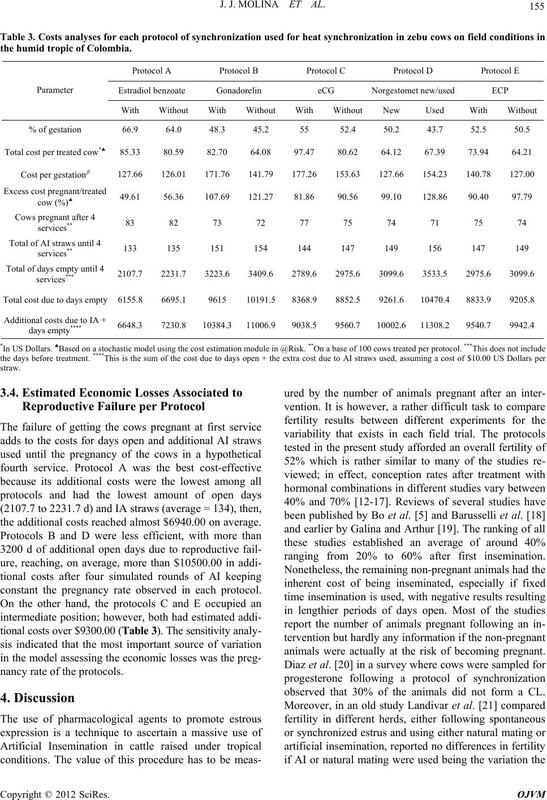 efficacy measured as pregnancy rate. comparison within each protocol; both calculations at 95% of confidence. the humid tropic of Colombia. the additiona l costs reached almost $6940.00 on average. 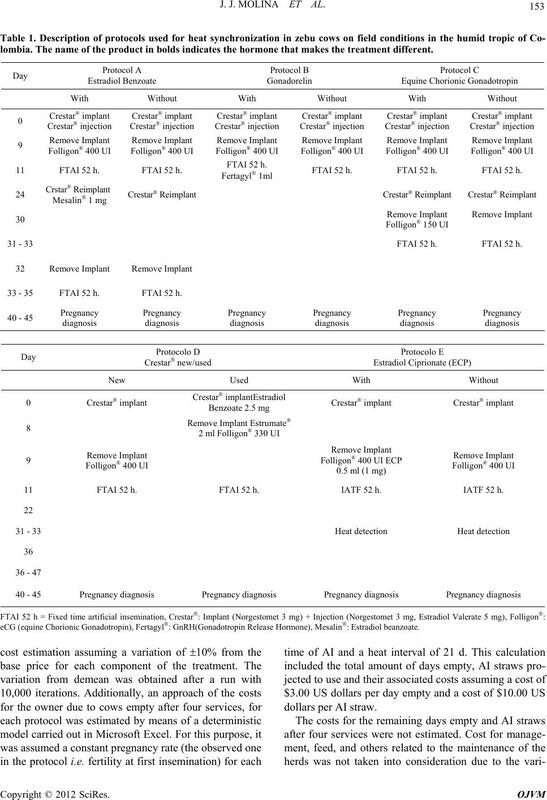 constant the pregnancy rate observed in each protocol. 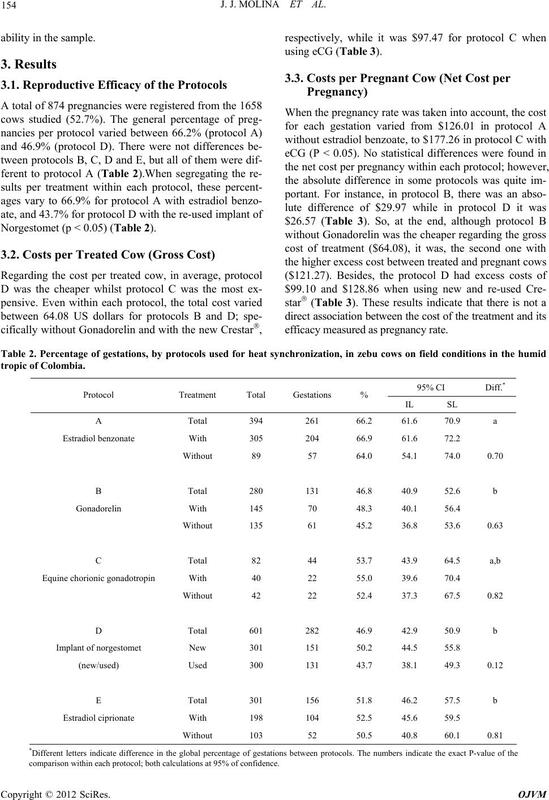 nancy rate of the protoco l s.
ranging from 20% to 60% after first insemination. animals were actually at the risk of becoming pregnant. observed that 30% of the animals did not form a CL. under tropical conditions if adequately used . equally distributed in all protocols. the average farmer for it has its place in stud farming. method that might not be cost-efficient. 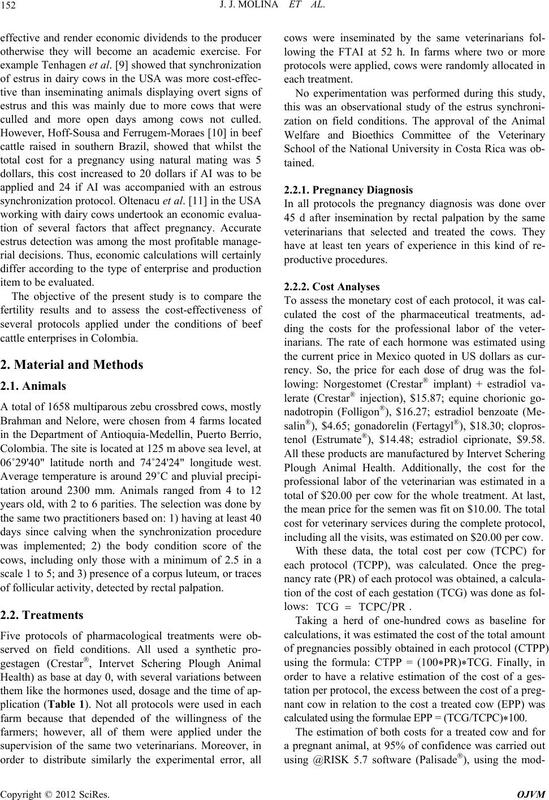 P. I. Rekwot, E. O. Oyedipe, E. Mukasa-Mugerwa, V. O.
tion and Artificial Insemination,” Veterinary Journal, Vol. Development, Vol. 40, No. 5, 2000, pp. 481-491.
havior, Vol. 52, No. 1, 2007, pp. 32-38. Animal Behavior, Science, Vol. 70, No. 1, 2000, pp. 1-16.
tional, Vol. 2011, No. 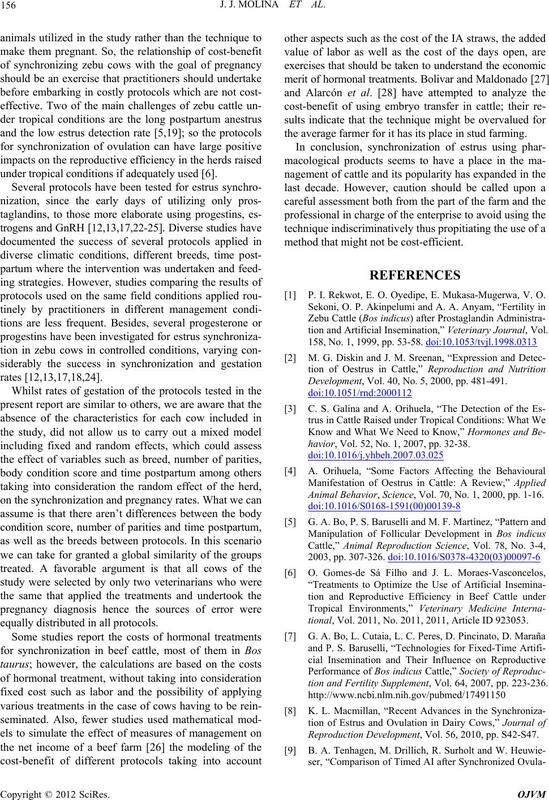 2011, 2011, Article ID 923053.
tion and Fertility Supplement, Vol. 64, 2007, pp. 223-236. Reproduction Development, Vol. 56, 2010, pp. S42-S47. Pecuária Sul, Rio Grande do Sul, Brasil, 1998.
ence, Vol. 73, No. 10, 1990, pp. 2826-2831. Theriogenology, Vol. 50, No. 8, 1998, pp. 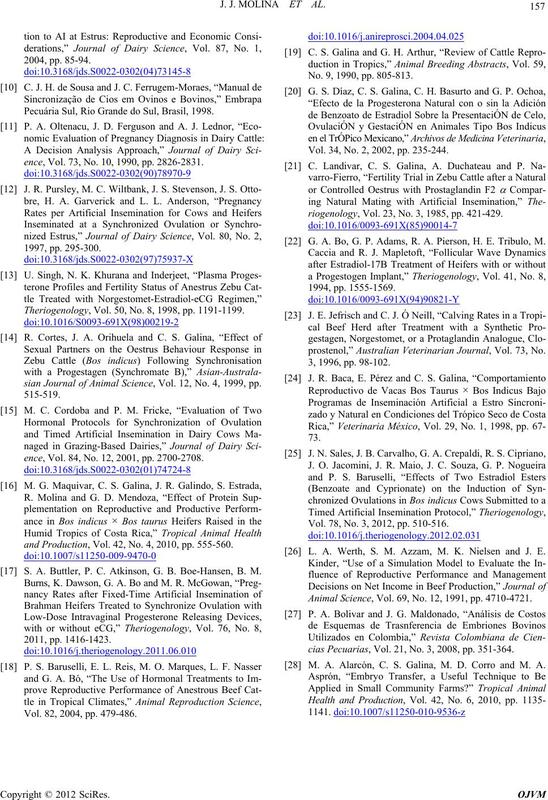 1191-1199.
sian Journal of Animal Science, Vol. 12, No. 4, 1999, pp. ence, Vol. 84, No. 12, 2001, pp. 2700-2708.
and Production, Vol. 42, No. 4, 2010, pp. 555-560. S. A. Buttler, P. C. Atkinson, G. B. Boe-Hansen, B. M.
Vol. 82, 2004, pp. 479-486. No. 9, 1990, pp. 805-813. Vol. 34, No. 2, 2002, pp. 235-244.
riogenology, Vol. 23, No. 3, 1985, pp. 421-429. G. A. Bo, G. P. Adams, R. A. Pierson, H. E. Tribulo, M.
prostenol,” Australian Veterinarian Journal, Vol. 73, No. Vol. 78, No. 3, 2012, pp. 510-516. L. A. Werth, S. M. Azzam, M. K. Nielsen and J. E.
Animal Science, Vol. 69, No. 12, 1991, pp. 4710-4721.
cias Pecuarias, Vol. 21, No. 3, 2008, pp. 351-364. M. A. Alarcón, C. S. Galina, M. D. Corro and M. A.